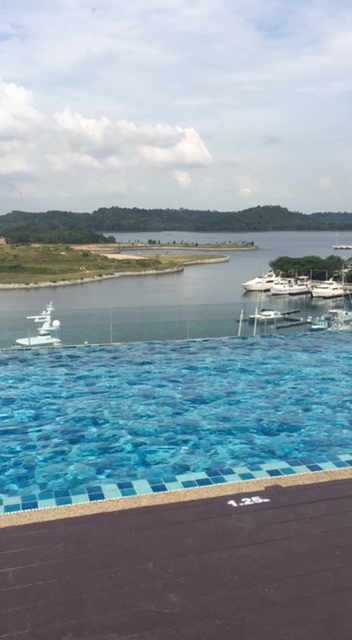 After the disaster of 70.3 Putrajaya back in April, it makes perfect sense that I would sign up for another hot, half-iron distance race in Malaysia. 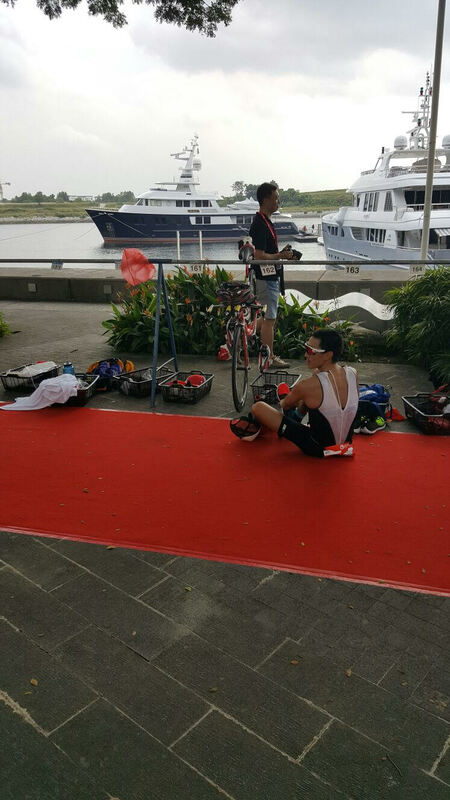 Challenge certainly did their best to make the race an attractive option – affordable entry fee, race pack filled with goodies, transition minutes away from the hotel and a race venue just a quick drive over the causeway. Training had been plodding along as usual. The hours, or lack thereof, were occasionally depressing to track, but I tried to nail a couple of key sessions to keep things moving. It wasn’t till about 3 weeks out from the race that things seemed to pick up. It’s amazing how motivating desperation can be. Suddenly, I was hearing my alarm in the mornings and squeezing out the odd session in the evening. Those weeks saw me flirting with 10 hours of training a week. I know right, mind blown. So with all that preparation, I hatched a fairly conservative race plan that would hopefully, get me to the finish line in one piece! The action on race morning kicked off with the pros, followed by mixed gender wave starts according to age group in 3 minute intervals. The swim course was pretty straight forward, basically taking us from one end of the marina to the other in a large rectangle. With only 400 participants, there was more than enough room for everyone so the probability of getting punched in the face during the swim start diminished greatly. We hopped in from the pontoon for a deep water start and off we went. The water in the marina was pretty clear and I only noticed two things the entire time I was swimming. One was these white, stringy things floating around in the water. It reminded me of those hot soups where you crack an egg and stirred it in. I was not tempted to perform a taste test. The other was the darkness that surrounded us when you looked down…like a never ending abyss…If you’ve read this blog before, you’ll know that I like to scare myself when it comes to open water swimming. I spent a lot of the time swimming with my eyes closed, trying to maintain my rhythm and take the shortest lines from buoy to buoy. It was a calm, flat swim with next to no current so I hopped out of the water in pretty good time, 28:17. This was the first race I’ve done where I’ve decided to wear my heart rate monitor. I always wear one during training but never to race. I wasn’t going to be flying through either transition (as part of my conservative race plan) so I thought this was a good chance to get some data that I could look at later. 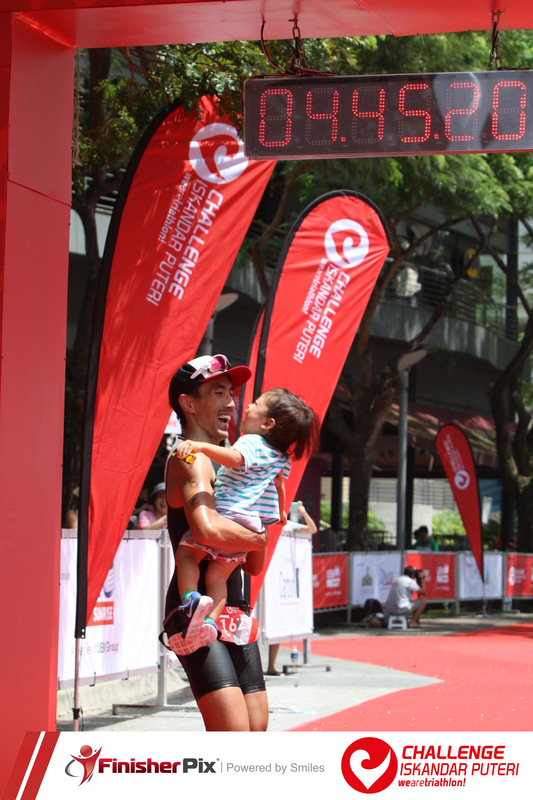 My parents and sister had made the trip to Iskandar to watch the race, so along with Meryl and Ollie, I had a nice little cheering section to look forward to seeing on each loop of the bike. Having done the bike familiarisation two days prior, I knew the bike was going to be hot and surprisingly windy. There were some gentle inclines and wide open roads, except for small stretches along the side of the highway. From my last few training rides, I knew where my HR had to be if I wanted to be able to run most of the half marathon. I really focused on riding a very measured bike leg because as is so often the case, once I’m racing, my legs tend to have more ambition than my training can back up. The only result there is a death march on the run leg, which I was very eager to avoid this time round. I felt pretty good through most of the ride, never putting myself into the red too much. I have to admit that having to purposely slow down at times to conserve energy for later felt odd at times. But you can only race as hard as you train for and I didn’t think I was going to miraculously discover some untapped store of fitness during the race, so this was definitely the smart thing to do. So after 3 laps of solo riding on wide, well paved roads, I was ready to get off the bike. I quite enjoyed the ride and my only wish was that there would have been a couple more aid stations along the way for us to grab water at. Sitting down in T2 is such a bad idea. I got the socks on, fiddled with my timing chip and had to remember to grab my running watch. Having my family cheering me on at T2 was a great lift and just the push I needed before heading back out onto the course. 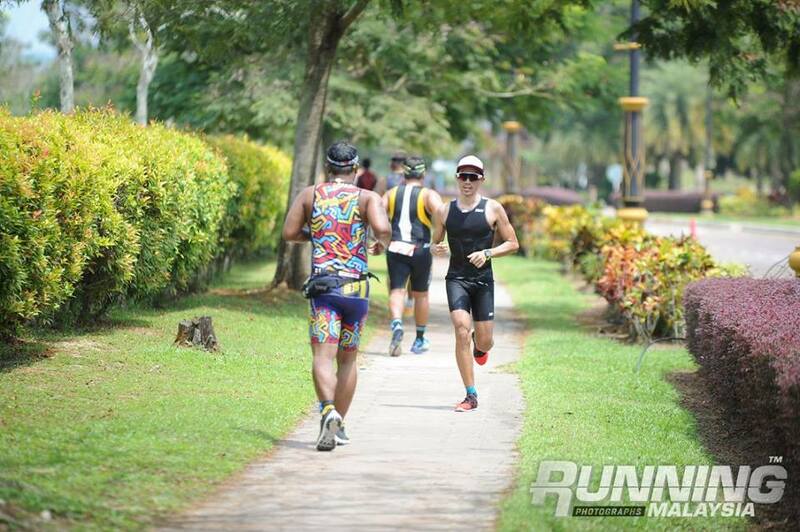 In PJ earlier this year, the wheels fell off right out of T2 so you can imagine my joy at making it to the 2 then 3km mark feeling pretty alright. By this stage, the run route merged back with the bike route so it wasn’t going to be particularly exciting. However, now that I was running, everything was going by a lot slower and I realised that we were basically running through a huge construction site. There were big patches of greenery and with so much construction going on, you felt like you were running in No Man’s Land some of the time. In a year or two, when the buildings and apartments have gone up, I think it’ll make the run much more pleasant. I was holding a pretty good pace and I was feeling very pleased. But I tried not to get ahead of myself. There was a lot of running left and the sun seemed to just be warming up. I planned to walk through the aid stations, grabbing drinks, food and ice, that definitely helped to keep me going. Alas, all good things must come to an end…By 15km, my legs decided they had had enough. The 1km alert on my Garmin kept taking long and longer to ring, which can really be quite depressing. The cramps stayed away but I was just getting super tired. David Watson (eventual top AGer) caught me during that time and slowly pulled away. I briefly considered mounting a spectacular comeback to shut down the gap to him, breaking away with a devastating kick at the finish. My legs told me not to be a fool. I didn’t want to blow up so close to the finish, so I walk-a-jogged a little in the last 3km. It’s important to save some energy for the photographers near the finish (I’m only half joking). Finally, after what seemed like an eternity, I reached the red carpet of the transition/finishing chute. I was happy that I had a good race for my family that had come to watch me. It wasn’t spectacular, but I was glad that I had a plan and actually stuck to it. This was the best result I could have hoped for with my limited training so it was all good. Shout out to Meryl for always supporting me and taking care of everything while I’m out racing or training – can’t do it without you! 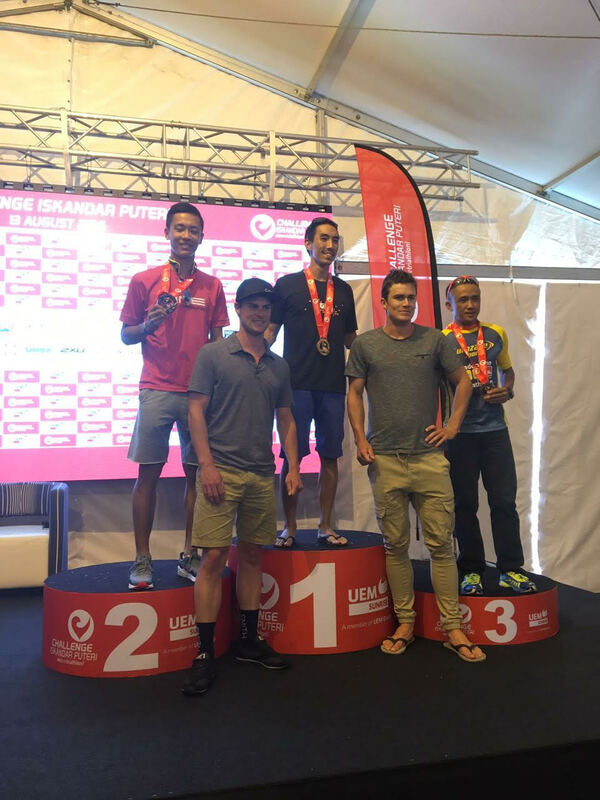 Big congratulations to Gideon, TJ and Nam on their races. 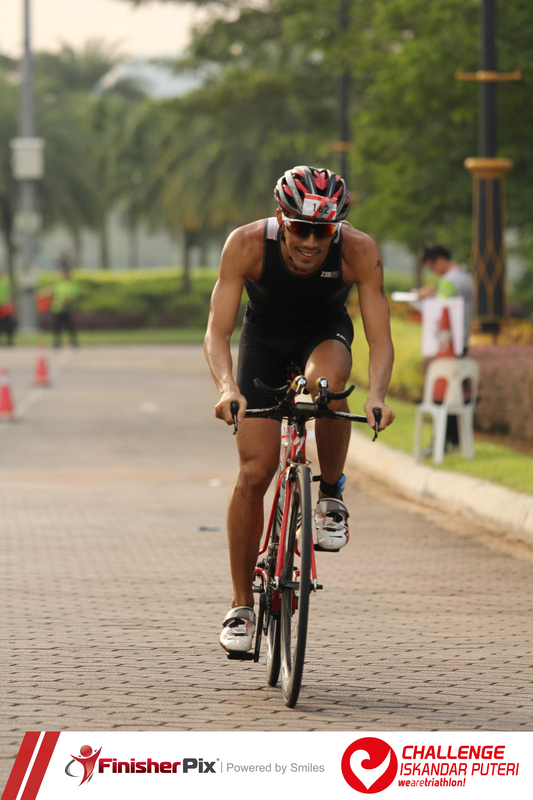 I thought the organisers put together a real good race for their first year running Challenge Iskandar Puteri. The atmosphere at the race was always relaxed and fun. I’m sure the event will get better in the editions to come. And what a nice surprise to get to download our Finisher Pix for free. So a pretty good outing with an AG win (30-34yrs) and second overall AGer. One more race next weekend before going back to short course mode. it was exciting to read a full tale of your participation to our event. It’s cool for us to see the event “from the other side” with the eyes of someone who actually raced it. We are proud that we made it worth your time and hard training. You can be sure that next year’s one will be so much better!